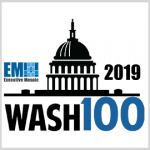 TYSONS, Va., Jan. 15, 2019 /PRNewswire/ — Executive Mosaic, the leading executive media and events company in the government contracting market, today announced the recipients of the 2019 Wash100 awards. The Wash100 recognizes the most influential and impactful executives of consequence at the intersection of government and industry. This year’s winners were selected by both the leadership team at Executive Mosaic and nominations received from top executives in the GovCon sector. Recipients have demonstrated superior leadership, innovation, achievement and vision. Based on their strong performance in 2018, these awardees are expected to drive the most value in the 2019 GovCon market. 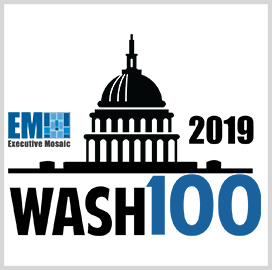 Executive Mosaic is proud that this year’s Wash100 list has struck a balance among government contractors, federal officials and other key GovCon categories. 2019 Wash100 Includes: Craig Abod (Carahsoft), Rick Ambrose (Lockheed Martin), Ken Asbury (CACI International), Lt. Gen. Robert Ashley(Defense Intelligence Agency), David Berteau (Professional Services Council), Vice Adm. Raquel Bono (U.S. Navy), Jim Bridenstine (NASA), Leanne Caret (Boeing Defense, Space & Security), Teresa Carlson (Amazon Web Services), Bruce Caswell (Maximus), Dan Coats (Office of the Director of National Intelligence), Michael Corkery (Deltek), Mac Curtis(Perspecta), Tom D’Agostino (Flour), Dana Deasy (DoD), Jerry DeMuro (BAE Systems), Matt Desch (Iridium), Tina Dolph(Siemens Government Technologies), David Drabkin (Section 809 Panel), Dr. Mark Esper (U.S. Army), Tony Frazier(Radiant Solutions), Tiffany Gates (Novetta), Mark Gerencser (UMUC Ventures), Amy Gilliland (General Dynamics Information Technology), John Goodman (Accenture Federal Services), Sue Gordon (Office of the Director of National Intelligence), Mark Gray (ASRC Federal), Michael Griffin (DoD), John Harris (Raytheon), Steve Harris (Dell EMC Federal), Gina Haspel (CIA), John Heller (PAE), Marillyn Hewson (Lockheed Martin), Barbara Humpton (Siemens Government Technologies), Rep. Will Hurd (House of Representatives), Timothy Hurlebaus (CGI Federal), Nazzic Keene (SAIC), Thomas Kennedy (Raytheon), Suzette Kent (The White House), Sudhakar Kesavan (ICF), Michael Kratsios (The White House), Christopher Krebs (DHS), George Krivo (DynCorp International), Roger Krone (Leidos), Christopher Kubasik (L3 Technologies), Dave Levy (Amazon Web Services), Hon. Ellen Lord (DoD), Michael Maiorana (Verizon), Chris Marzilli(General Dynamics Mission Systems), Kevin McAleenan (Customs and Border Protection), Jim McAleese (McAleese & Associates), Scott McIntyre (Guidehouse), Gen. Mark Milley (U.S. Army), Tony Moraco (SAIC), Emily Murphy (General Services Administration), Ramzi Musallam (Veritas Capital), Lt. Gen. Paul Nakasone (U.S. Army), David Norquist (DoD), Phebe Novakovic (General Dynamics), Kevin Phillips (ManTech), Larry Prior (The Carlyle Group), Jason Providakes (MITRE), Chuck Prow (Vectrus), PV Puvvada (Unisys), Jim Reagan (Leidos), Tim Reardon (Constellis), Anthony Robbins (NVIDIA), Dr. Will Roper (DoD), Betty Sapp (NRO), Julian Setian (SOSi), Pat Shanahan (DoD), Lt. Gen. Jack Shanahan (DoD), Vice Adm. Robert Sharp (NGA), Stu Shea (Peraton), Gwynne Shotwell (SpaceX), Jill Singer (AT&T), Paul Smith (Red Hat), Mark Sopp(KBRwyle), Richard Spencer (U.S. Navy), Jean Stack (Baird), Todd Stottlemyer (CNSI), Mark Testoni (SAP NS2), Seema Verma (CMS), John Vollmer (AECOM), Lou Von Thaer (Battelle), Rick Wagner (ManTech), David Wajsgras (Raytheon), Dr. Steven Walker (DARPA), Kathy Warden (Northrop Grumman), Sen. Mark Warner (U.S. Senate), Greg Wenzel (Booz Allen Hamilton), Rich White (SSL Government Systems), Al Whitmore (BAE Systems), Robert Wilkie (U.S. Department of Veterans Affairs), Xavier Williams (AT&T), Hon. Heather Wilson (U.S. Air Force), George Wilson (ECS Federal), David Young(CenturyLink), David Zolet (LMI). 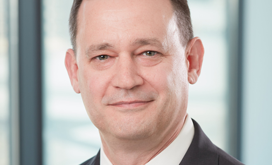 Jim Garrettson founded Executive Mosaic in 2002 to provide a cross-media platform and exclusive forum for top-tier executives in the Washington, D.C., region. Executive Mosaic offers highly coveted executive events, breaking business news on the GovCon industry, and robust and reliable content through influential websites and three consequential E-newswires. Headquarters are located in Tysons Corner, Va. Visit www.executivemosaic.com.